"Politicks are now nothing more than means of rising in the world. With this sole view do men engage in politicks, and their whole conduct proceeds upon it." With little fanfair and almost negative column inches the US Senate approved an extention of the Farm Bill with minor cuts. 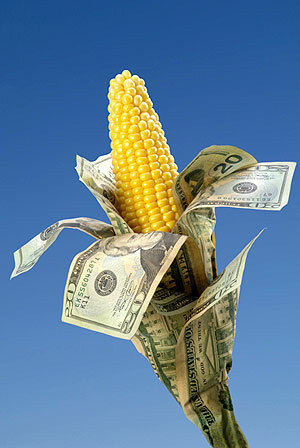 Despite the horrendous weather conditions in the plains states (i.e Corn Belt) and the failing harvest the proposed extention of the Farm Bill will fortuitously include a lavish provision for crop insurance programs that will protect farmers against both natural disaster and market fluctuations. In the press recently the spin doctors are ominiouly foretelling that the price of diary and meat will to go through the roof in the last quarter of the year. That hits all of US consummers hard in the wallet as we attempt to buy those government subsidised groceries. It's apparent that the Farm Bill of 2008 needs to be meaningfully overhauled AGAIN but when the US House of Representatives finally drafts their version it is likely to be a near carbon copy of the Senate's bill. The extention is slated to dole out about $96 billion a year to subsidies on “specialty crops” (read: primarily corn and soy) about $50 billion which will be in direct payments to mostly large agribusinesses. The non profit think tank, Environmental Working Group (EWG), has accumulated an impressive database of information about farm subsidies. Curiously, Nebraska comes in number 5 on the list of top recipients which is above states like California and Ohio with vastly larger populations. Offset that with more than $150 billion every year spent on government sponsored dietary programs and the subsequent medical costs of dealing with arthritis, diabetes and heart disease because of the ubiquity of cheap corn and soy in processed food. The subsidised corn is fed to live stock, used as supplement in refined gasoline (i.e. Ethanol) as well as being omnipresent in the form of high fructose syrup found in a mindboggling amount of processed foods. Where are the government subsidies for fruit and vegetables? They tout them as being cornerstones to a child's beneficial nutritional plan. In actuality it's nothing more than a shell game which highlights the collusion between government and big business. At worst it is a form of disinformation which pays lipservice to a glaringly false altruism. When will the smoke and mirror game played on the American public by the insidious marriage between big business and government finally be shut down? Update (31 July 2012) on the aMAIZEing Farm Bill double dip. I tried contacting both US Senators from Nebraska, (D)Mike Johanns and (R)Ben Nelson, for an answer to the disproportional allocation of farm subsidies to their state. Neither was available for comment and I was politely yet resolutely encouraged to compile my questions for the Senators in an email. Strikingly, I was not told nor did I remember to ask if the Senators or someone from their staff will address my questions. Already chalked it up to a cub reporter mistake. If I ever receive a response I will post it asap.